In a bread discussion forum that I joined in early winter when I was struggling not to be such a greenhorn with breads, the book Secrets of a Jewish Baker kept popping up. Members would praise it to high heavens and some thought it was the bread bible of the 21st century. The author, George Greenstein, seems to be a favorite of many bakers and bread fanatics. Lingering in the food section of my local library this afternoon looking for herbs and spices to write about for my other blog on translation, something caught my eye. At first I saw the word “Jewish”, and then the other word “baker.” That’s when it clicked. I bent over and eureka – it was THE book that forum members have been treating with unusual reverence! Others were proudly announcing that they had put an order on the book and couldn’t wait to start trying the recipes. Secrets of a Jewish Baker must be in everyone’s kitchen. At first I thought that Peter Reinhart’s Bread Baker’s Apprentice would suffice. No. 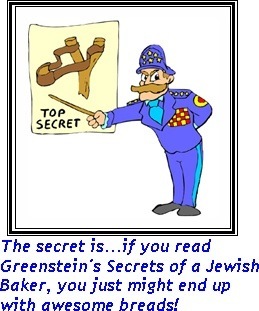 You ought to add Mr. Greenstein’s book if you like creating bread – yeast or non-yeast. The Reinhart and Greenstein combo will help increase your baking confidence. Keep them within reach! What rare gems did I find in Mr. Greenstein’s book, you ask. Plenty. What I enjoyed reading were the baker’s secrets that the book is generously sprinkled with. I gained valuable tips and I don’t want to offend Mr. Greenstein by putting them all here. Besides I do encourage you to purchase the book. It’s available on Amazon for about $20.00 (ISBN: 13:978-1-58008-844-2 and ISBN-10:1-58008-844-9). As I’m scrolling down the Amazon site, I see that Mr. Greenstein has also published Jewish Baker’s Pastry Secrets: The Art of Baking your Own Babka, Danish, Sticky Buns, Strudels and More (April 2009). Amazon does not have it yet on stock but will inform customers once the book arrives. If you leave fresh bread flour to age for 5 to 6 weeks, its flavor and color are enhanced. Before sprinkling seeds on challah, allow egg wash to air dry. Brush bread with egg wash the second time. This gives it more shine. When you have empty muffin cups in the muffin tray (because you ran out of batter), put 1-2 tablespoons of water on the empty cups to keep them from burning. When it’s time to return this book, I’ll have to order my own copy and maybe treat myself to his pastry book. 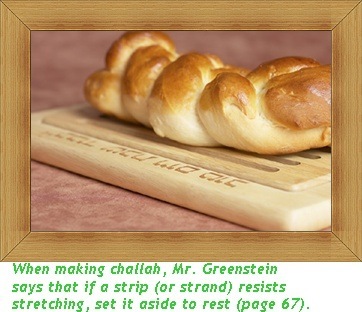 A very minor disappointment with Secrets of a Jewish Baker: there are no color photos of Mr. Greenstein’s masterpieces. But the absence of color photos does not in any way diminish the quality of the book. It reeks of wholesome flavor…and expertise you don’t come across everyday! So Mr. Greenstein, do you give classes?